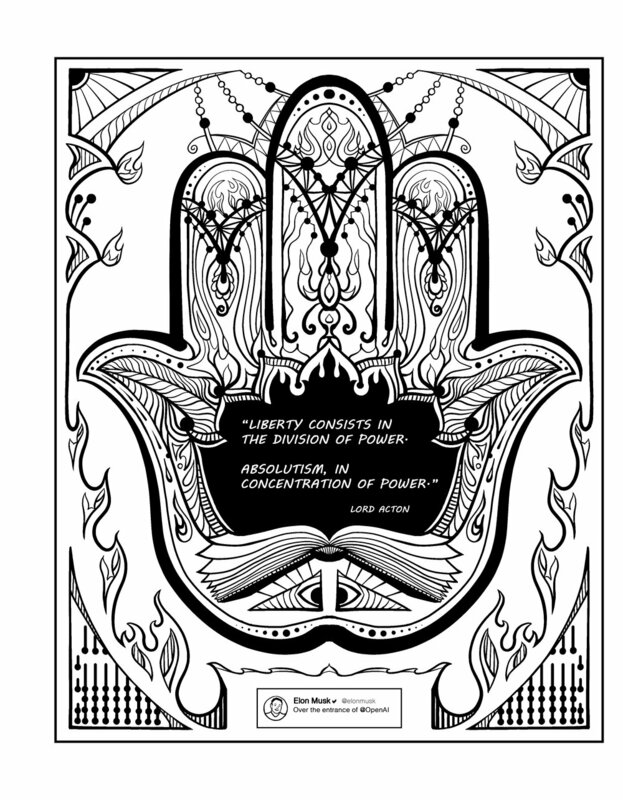 The meditative effect of coloring in a coloring book can be garnered as a tool in normalizing cultural movements. Currently we are experiencing the dawn of on-demand electric transportation on a global scale, as well as a renewed space age that holds the hope for unhindered scientific experimentation and exploration. Coloring books, aside from providing relief from the effects of our busy lives, induce a trance-like state of mind that can open up the unconscious to new realities. By incorporating subject matter that relates to current cultural shifts, coloring books might be a method for spreading a desired change in attitude among certain populations. The therapeutic value of coloring has been documented by a group of New Zealand researchers, who found in a study group that coloring (as opposed to doing Sudokus) brought about a decrease in symptoms of depression and anxiety. It is no secret that the coloring book craze was fueled by more than just nostalgic impulses to return to a childhood past time. The top reasons coloring books came onto the commercial scene so suddenly were largely due to the calming effects of coloring and the fact that it's an activity that is disconnected from electronic devices (something we desperately need to balance our daily lives). It's also very portable and can be done while waiting in a doctor's office or talking on the phone. It can be done by anyone, democratizing the process of art. The same part of the brain that produces anxiety and stress is the part that is needed to color in a coloring book (choice of color, repetition, etc.) so that part of your brain that engages in negative thinking patterns is actually calmed by redirecting the energy onto the coloring page. Finally, with all the patterns, details and repetition involved in coloring these intricate designs, it becomes a meditative activity that serves to sharpen the mind by way of focus. People report that the activity has a mesmerizing, trance-like effect. It is this latter effect that makes it a unique medium for transporting cultural messages to the conscious and unconscious mind. When the mind is calm and focused it is primed for receiving new information and new ideas. It is almost as if the child inside is awakened during the process of coloring, and a child's mind is a learning mind. When learning about electric transportation, it's best served with a side of climate change information. The Yale Program on Climate Change Communication recently released the Climate Change in the American Mind: 2018 Report, which was an exhaustive study on the patterns of thinking about climate change. It turns out that few Americans are confident that humans will reduce global warming and that only about 1 in 3 Americans say they discuss global warming with family and friends “often” or “occasionally”. Yet, 7 in 10 Americans think global warming is happening. So how do we get more people to adopt this subject matter into their household conversations, and to start paying attention to new industries and startups that are aimed to combat global warming? According to NASA, the role of human activity in causing climate change cannot be denied. The most important long-lived forcing of climate change comes from carbon dioxide emissions, such as burning fossil fuels like coal and oil, which has increased by more than a third since the Industrial Revolution began. A panel of over 1300 scientific experts from around the world have aired through the United Nations that there's more than a 95% chance that human activities over the last 50 years have warmed the planet. Enter Tesla. Poised as the first major disruptor of the combustion engine vehicle, Tesla is finally starting to hit their goals in the production of electric cars. While detractors of the company complain that the lithium-ion batteries used in electric cars are an environmental hazard, scientists are working to redesign the batteries to be less toxic by using organic molecules instead, thus keeping future generations in mind. Not only that, technology will evolve to be able to efficiently recycle lithium-ion batteries when the cars have gone through their life cycle. A number of sustainable recycling methods have already been proposed. Sustainable energy is increasingly defined as an energy system that serves the needs of the present without compromising the ability of future generations to meet their energy needs. We're entering an era of fossil fuel phase out, and electric vehicles can source renewable energy like solar power for charging batteries. Raising these issues in a coloring book brings current events right into the home for everyone to see and talk about. Okay, so Tesla is a no-brainer. But why SpaceX and the quest to colonize Mars? If you haven't already skimmed through the United Nations Office for Outer Space Affairs' Moon Treaty of 1979, now's a good time to catch up. One big takeaway from it is that it states that all celestial bodies shall be used exclusively for peaceful purposes and the freedom of scientific experimentation and exploration. The latter is incredibly important for keeping progress going in the human race, and the former is just downright important to all of us in a shared, connected world. A new space age is upon us. Just a few of the beneficial areas of study in space are sustainable development, global health, agriculture, disaster management and international peace and security. And in terms of new human colonies where we can test new ideas and ways of living, Mars scales up best. Rather than go into the details of why, you can read Elon Musk's Mars manifesto here, and it's all made possible through SpaceX's reusable rockets. SpaceX is making the privatization of the space race popular. It's no longer solely a governmental endeavor. Yet, people remain hesitant to let science and progress run free at the hands of private companies. “A survey conducted by Morning Consult for Bloomberg Businessweek found that only 37 percent of respondents - drawn from a spectrum of backgrounds and political affiliations - thought private companies should play a major role in space exploration.” Again, how do we change the narrative on a popular level? Furthermore, SpaceX currently employs around 700 females which is only roughly 14% of their workforce. How do we grow those numbers to invite more females to the business and by default, more people in general? Traditionally, the coloring book craze has a target market of adult females. That means those females could potentially expose their daughters to coloring books and even offer them some pages to color themselves, opening up conversations between parents and their kids in a way that was typically male gendered previously. By igniting the imagination via coloring scientific subject matter, we encourage our creative mindset to work in tandem with scientific inquiry and the reality of the world we are creating for future generations. Coloring activates both sides of the brain. Coloring books can be a tool for shifting the collective conscious and for normalizing what is currently still up for debate but shouldn't be. The mesmerizing effect the activity has on our brains makes it a unique delivery system for cultural updates and highlighting issues that face humanity, while also providing therapeutic benefits of relaxation and mental focus. Coloring isn't just for kids. It's a family thing, and revolution starts with the family first. 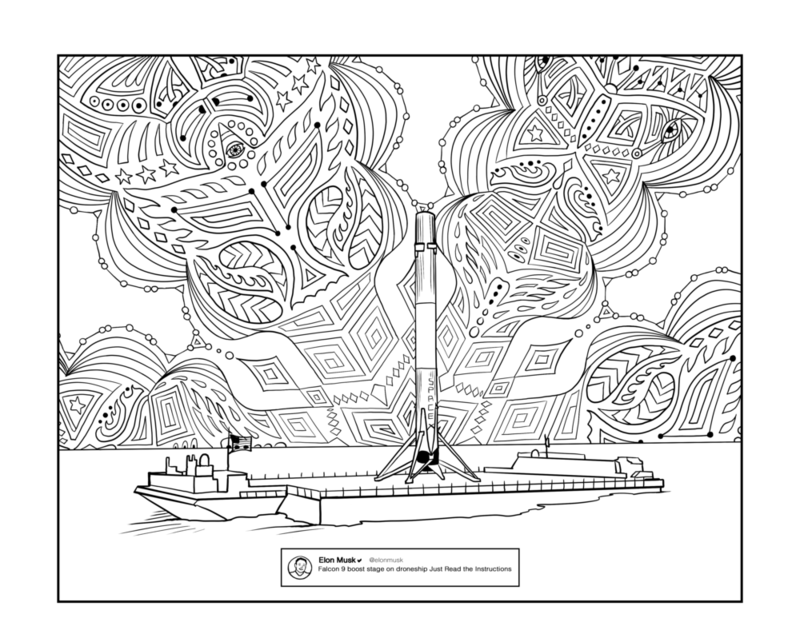 Might I suggest, the Illuminated Tweets of Elon Musk coloring book? Coming soon to a table near you.